I love meeting with and hearing from readers! Drop me a line to let me know your experience in reading my work. 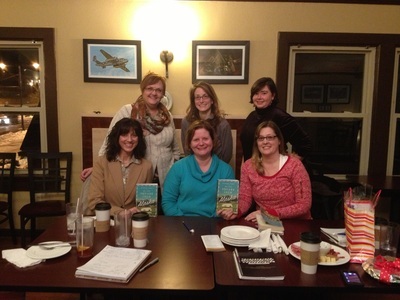 If you're in the southwestern Ohio area, I'd be glad to visit your book club, book store, or library readers' group. Or, let me know you're gathering to discuss my work, and I'll send along free book marks! Outside southwestern Ohio? I'm happy to join you via Skype, ooVoo or Google Hangout... or in person if my schedule permits and my travel costs are covered. And for readers of My One Square Inch of Alaska, don't forget to check out the novel's Reader's Guide. I've met with small groups and given speeches to gatherings of more than 200 people! I can customize the topic (just contact me to start the discussion) or you can opt for one of my popular topics listed below. Please contact me to discuss topics, scheduling and rates. Seven Steps to Embracing the Power of Dreams--the importance of embracing your own dreams AND encouraging others to do so, with practical steps for making that happen. Behind-the-Scenes Look at Writing "My One Square Inch of Alaska"--Were there really deeds to just one square inch of Alaska in 1953? How did I research this--and other fascinating details--of the novel? How did I find the idea... or rather... how did the idea find me? And just what was the often hair-raising journey from idea to publication? 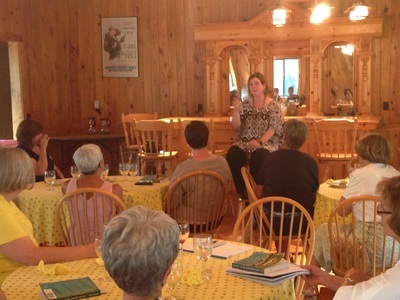 Ten Life Lessons I've Learned From My Writer's Journey--Inspirational talk is geared for all audiences. Sanity Checks!--Humorous yet insightful look on why we all need them, and at the power humor has to help us learn, heal and grow. The Literary Life--Why It Matters; How to Embrace It--This inspirational talk draws on my own writing life and my experiences as Literary Life columnist for the Dayton Daily News. Geared for all audiences, including high school students. Toolkit for the Artist's/Craft Person's Life--Eight Practical Tools--Writers, artists, craftspeople all need specific tools and skills to help them succeed, whether their art or craft is an avocation or something they hope to do to generate income. For this talk, I draw on my writing life, as well as my experiences managing my own marketing communications company for more than ten years. Is your writers' group seeking inspiration, insight and/or instruction in creative writing craft topics or today's paths to publishing? I draw on more than 20 years' worth of experience in professional writing and publishing, marketing, and directing a large non-profit creative writing organization to help writers' groups. Rates are $100.00 for two-hour program (minimum), $250 for half-day program; contact me regarding longer programs or for scheduling and topics.